I’m sorry to hear about (and am mystified by) Bob Nixon’s blossom end-rot quandary since everything he’s examined and tested for is what I recommend to my friends around here they deal with blossom end rot — primarily uneven water coupled with or exacerbated by low calcium (or perhaps low calcium uptake, which is not necessarily the same as low calcium). My Big Mamas, which I intersperse with the heirloom Rainbows and Purple Cherokees, have so far been doing pretty well, though are not coming on like gangbusters as we’ve come to expect over here on the Eastern Shore about this time of year. In fact, a number of people are complaining about how slow and uneven harvests of vegetables have been. A caterer friend who normally has fantastic production came and scoured my garden for cherry tomatoes for dinner she had to do. And I’ve been plagued by a weird stripe around a love of my slicers — the Beefsteaks in particular — that shortens the shelf life considerably. One thing we’ve had that has so far been good for us over here — despite the plethora of bugs and other critters we’ve been contending with — is hardneck garlic. (Just as every other crop in farming and gardening, some years for some things are better than others). I had watched Theresa Mycek, the grower/manager of Colchester CSA down the road from us here on the Eastern Shore, plant hardneck garlic for several years before I tried it myself. One autumn, I bought several more heads of Music and Keith’s garlic than I thought I’d need for the winter, broke apart the bulbs and planted the cloves. They need to be spaced about 10-12 inches apart in well-drained soil. (One year I planted them on the more shady northwest side of the veg garden, and mulched them with straw as I have every year, but the shadiness and mulch kept the ground too moist and they rotted. After that, I was careful to get them plenty of sun, and to be sure the straw mulch wasn’t sodden for long stretches in winter so they could breathe.). Fresh hardneck garlic is great stuff. First you get the scape, like a green curly fry in about the first week or two in June. You clip it, then can roast it with chicken or other meats, chop it either fresh or sautéed into omelets, dip it in tempura batter for a yummy starter, grill it with meats or add it, sautéed in butter to goat cheese popovers (among other things). Several weeks later, when the stalks have begun to dry and the bulbs are fully formed (sometimes it takes digging one up and having a look to be sure they’ve done this before you harvest the entire patch), you dig it – or yank it, depending on how soft the ground is and bring them into some place coolish, airy and dry to cure. I hang mine in clumps of about 5 bulbs each tied together from the ceiling on the porch, where it looks appealingly rustic (to me, at least –it probably looks pretty unkempt to visiting city folks). The porch is attached to the kitchen so it’s easy to grab some – a pair of scissors separates the bulb from its stalk — to chop into the spaghetti sauce, salsa, cacciatore, whatever. Juicy, crisp and fresh, it’s more flavorful than the softneck bulbs in the grocery store, and oh-so-satisfying to use. I’ve been chopping it into the homemade spaghetti sauce that I’ve been canning for a couple of weeks now as the tomatoes ripen in what appears to be a well-conceived-and-executed staggered planting, but is actually the result of time-and-energy constraints in planting season. 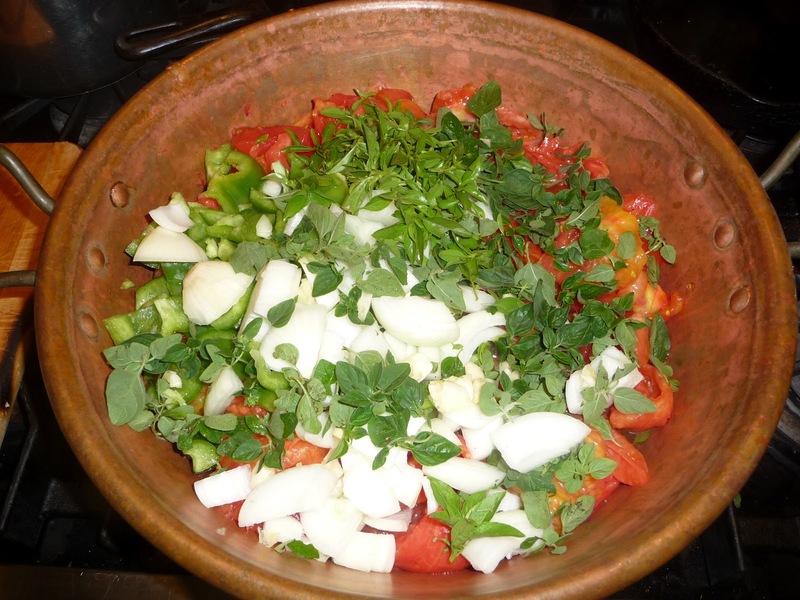 Add it to hummus, salsa, gazpacho, soups, stews, cacciatore, sautéed green beans with cherry tomatoes, herbs and onions. I sometimes make aioli with a fresh bulb using the eggs I buy from the CSA It’s nice in eggplant and garbanzo stew, and in this wonderful summer squash casserole recipe I got off Food 52’s website last year, that uses yellow squash and zukes as well as fistfuls of herbs and cheese. I roast it with cherry tomatoes and spread the result on toast, and have been putting it into gazpacho with the Padron peppers, a Spanish tapas favorite I grow that are like culinary roulette (about every 9thone is fairly incendiary while all others are mild. They’re and are great flash fried with salt, pepper an lime juice for cocktails or snacks). Throw it all into a blender or food processor and blend/pulse until it’s soup-=like, but with chunks of vegetables still easily identifiable. Chill for a couple of hours and serve with garlic toasts. Perfect fo have in the frig when the weatherman predicts several days of upper 90’s. Thanks for a great post! I weep as I see your Big Mamas! They aren't coming exactly fast and furious, though, Bob. And you should see my so-called Beefsteaks. Nearly all have this peculiar uneven stripe around them, as thought they thought about cracking, or maybe a slug meandered around them a little, but neither explanation actually fits. And along the stripe, not surprisingly, they are much more vulnerable to rot, so I've been picking every day and making salsa and spaghetti sauce with them. Ideas? Do you purchase your garlic to plant? If so where? Or do you just save some from year to year? 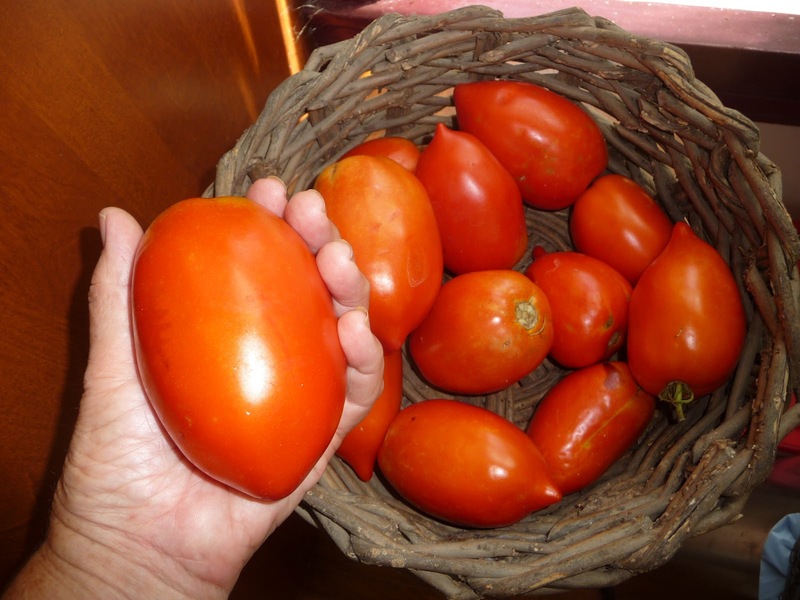 I have had lots of blossom end rot on all my paste tomatoes (Amish Paste, San Marzano and Gilbertie) and not on the other ones. Go figure! Edoogg, sorry it's taken me so long to reply. I have purchased my hardneck from Theresa Mycek of Colchester CSA down the road from us for a few years, and have been building my own planting supply. Last year I bought two big bulbs from her, then planted mostly my own. I always choose the biggest bulbs to plant since I prefer to work with large cloves. You could come over here to the Chestertown Farmers' market to scoop up some one Saturday this year. I suggest you check out the Colchester CSA website if you're gonna make the drive, however to be sure they'll have it on offer. (The website is http://www.google.com/search?client=safari&rls=en&q=colchester+farm&ie=UTF-8&oe=UTF-8.) Wander round the market (Saturdays 8-noon), very friendly people, eggs, veggies, wool, meat, artisanal bread, Eve's cheese, handmade soaps. All good stuff. Go get coffee and a stun bun (you won't be sorry) at Evergrain Bakery, or an Alaskan (essentially a caffeinated milkshake – yum! ), at Sam's. crab soup, seafood wraps, river view, etc etc. All within easy walking distance. Sabine, I'm having much more trouble (at the moment) with caterpillars, blister beetles and those blasted tiny little black things that invade every tiny opening in a tomato.